Edwards began his career with Hull City in 1997. 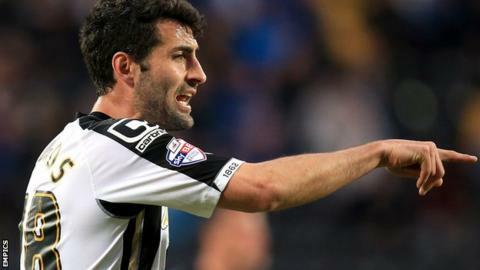 Veteran defender Mike Edwards says the Notts County team is "growing" after an inconsistent start to the season. The 35-year-old scored twice in Tuesday's 4-1 win over Crawley - the Magpies' fifth victory of the season. "It's a growing team, we just need to keep improving," said Edwards, who is also the League Two club's strength and conditioning coach. "I scored a brace in a reserve game when I was 18 but that's the first time I've ever scored a professional one." His feat also won him an unusual wager with one of the club's workers. "I had a bet with one of my interns," he told BBC Radio Nottingham. "I look forward to seeing him in his mankini!" Victory over Crawley was County's third in their last four matches and lifted them to 16th in the table, as they bounced back from the previous weekend's late defeat by Wimbledon. "After Saturday we needed to give the fans some repayment," Edwards said. "It's a long season with a lot of points to play for, but we're just going to keep working hard."